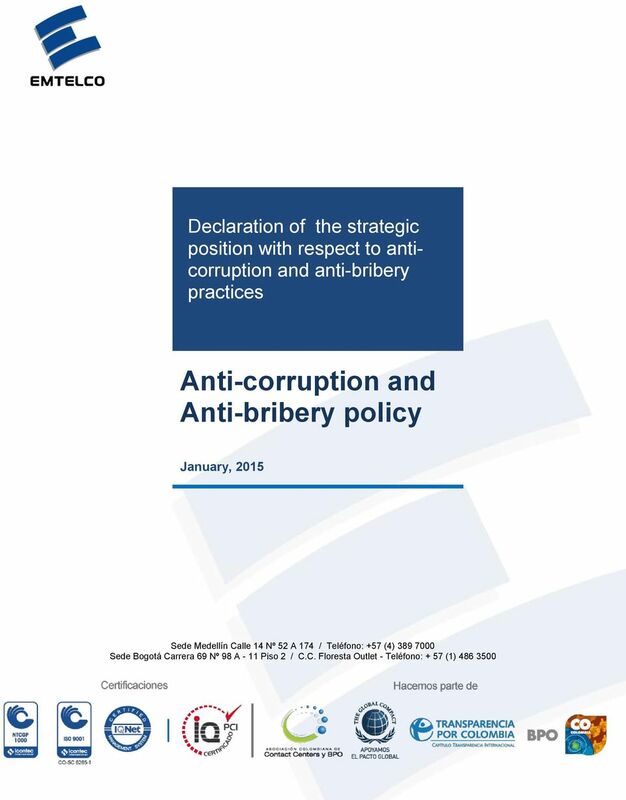 Download "Anti-corruption and Anti-bribery policy"
3 Justification Millicom Group s business philosophy and its growth strategy for various markets around the world require it to have corporate governance and management schemes of the highest international standards in addition to total compliance with the local and international regulatory frameworks. 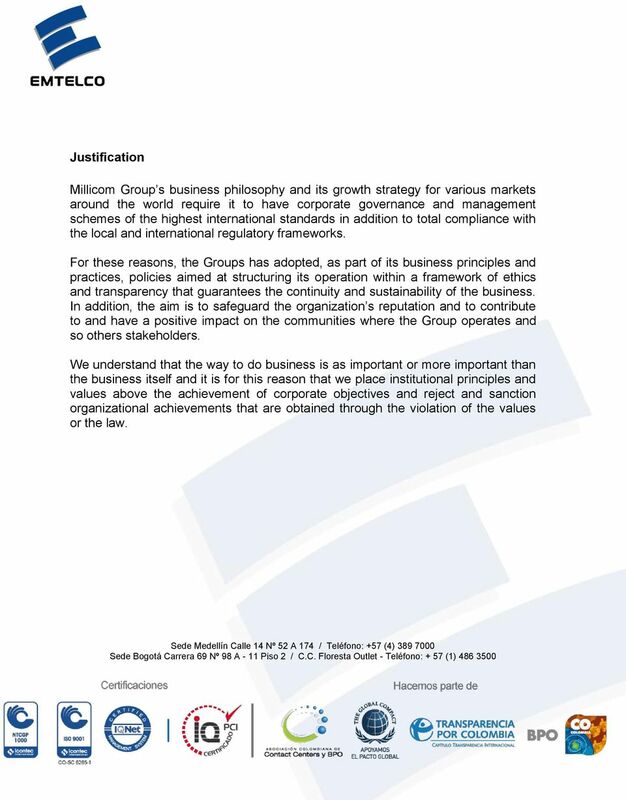 For these reasons, the Groups has adopted, as part of its business principles and practices, policies aimed at structuring its operation within a framework of ethics and transparency that guarantees the continuity and sustainability of the business. In addition, the aim is to safeguard the organization s reputation and to contribute to and have a positive impact on the communities where the Group operates and so others stakeholders. 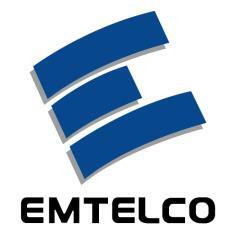 We understand that the way to do business is as important or more important than the business itself and it is for this reason that we place institutional principles and values above the achievement of corporate objectives and reject and sanction organizational achievements that are obtained through the violation of the values or the law. 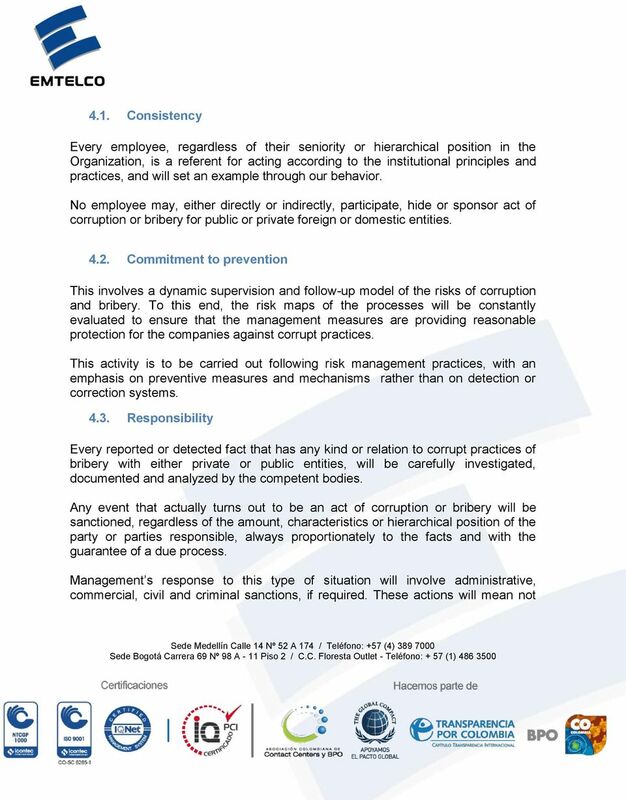 7 only notifying the respective authorities about the acts of corruption, but also assistance with the process by those legally responsible parties in the companies Duty to denounce Every employee of the company and related third parties, especially those with which there are commercial or contractual relations, is obligated to report to Management all acts or circumstances that might be considered corruption or bribery. 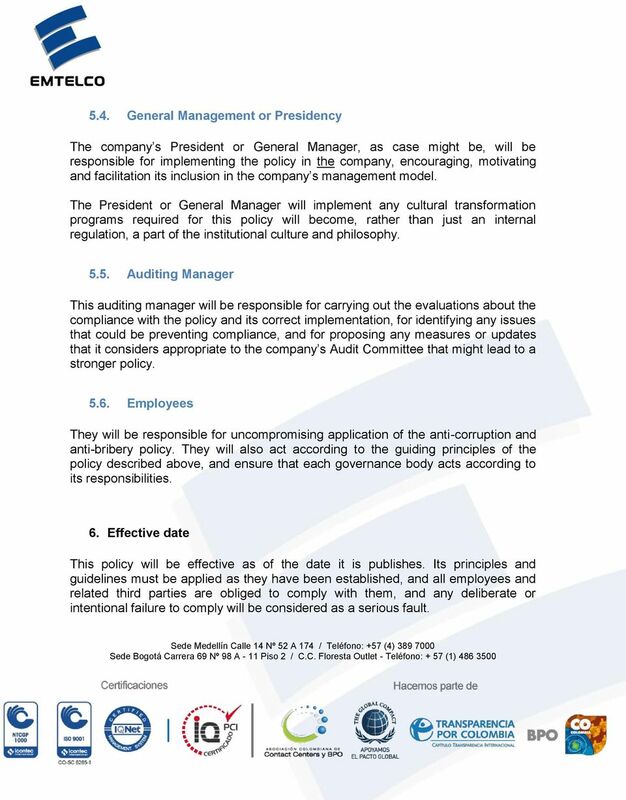 The various institutional channels available at the company, such as the immediate superior, the vice-president or Director of the respective area, the manager of auditing, the audit committee, the ethics committee, the general managers of the companies, and specially the ethical line. 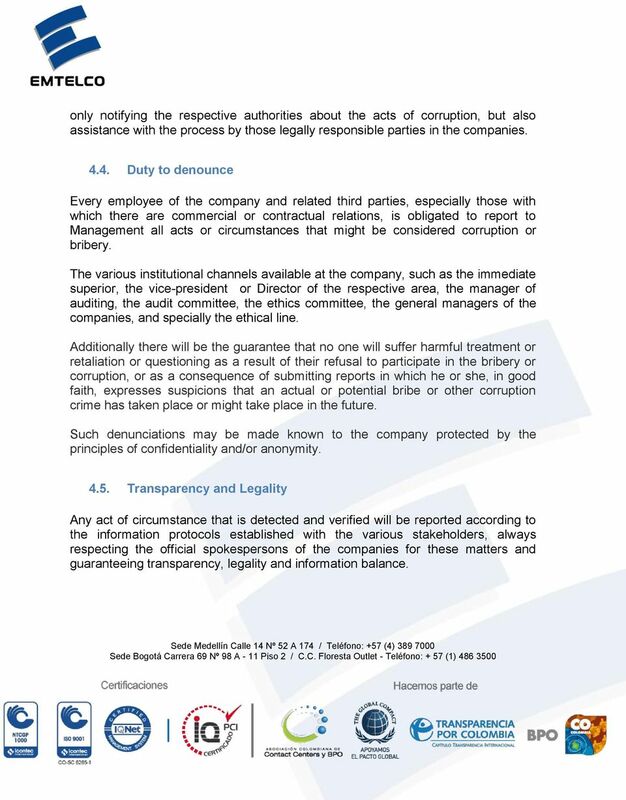 Additionally there will be the guarantee that no one will suffer harmful treatment or retaliation or questioning as a result of their refusal to participate in the bribery or corruption, or as a consequence of submitting reports in which he or she, in good faith, expresses suspicions that an actual or potential bribe or other corruption crime has taken place or might take place in the future. 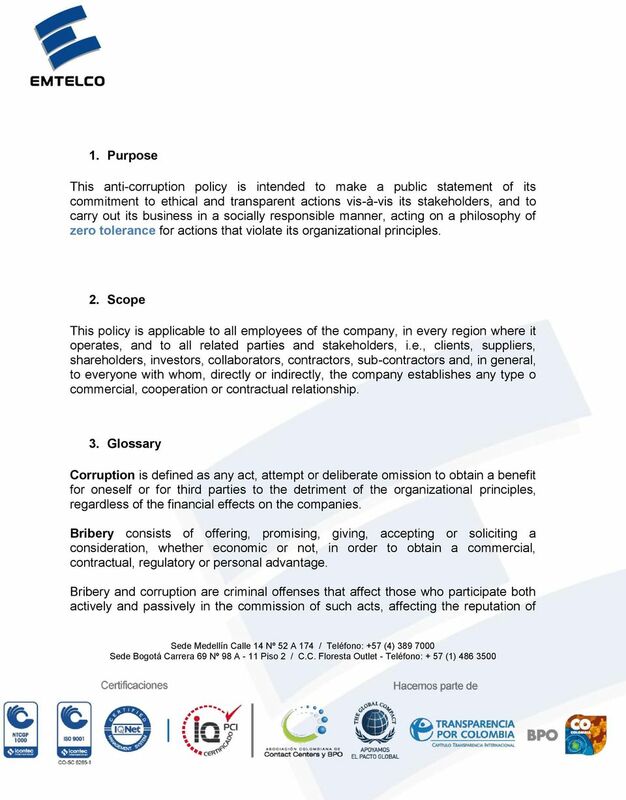 Such denunciations may be made known to the company protected by the principles of confidentiality and/or anonymity Transparency and Legality Any act of circumstance that is detected and verified will be reported according to the information protocols established with the various stakeholders, always respecting the official spokespersons of the companies for these matters and guaranteeing transparency, legality and information balance. 8 5. Governance and responsibilities 5.1. Board of Directors The Board of Directors, as the highest body for Corporate Governance and Control, shall define the anti-corruption policy for the company and will keep it upto-date according to the regular reviews resulting from recommendations made by management, Auditing or the Audit committee Audit committee The audit committee will be responsible for supervising the implementation and adoption in the companies of the anti-corruption and anti-bribery practices and principles by means of the evaluations carried out through the company s manager of Auditing Improvement plans resulting from the deviation identified during the evaluations performed by Internal or External Audits will be carefully supervised by this committee to ensure that such measures are effective and help prevent the risk both by reducing the probability of occurrence and the severity of the events Ethics committee The Ethics Committee will be responsible for handling any denunciation of corruption or bribery that are brought to its attention, and will order the appropriate investigations to identify the sources that allowed the risks to take place, and provide feedback to the owners of the processes about those vulnerabilities. 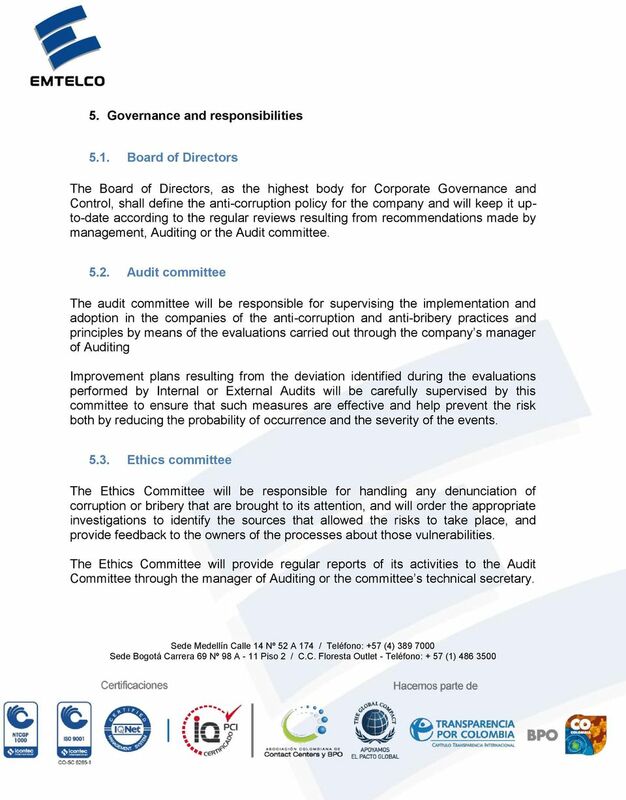 The Ethics Committee will provide regular reports of its activities to the Audit Committee through the manager of Auditing or the committee s technical secretary. 9 5.4. General Management or Presidency The company s President or General Manager, as case might be, will be responsible for implementing the policy in the company, encouraging, motivating and facilitation its inclusion in the company s management model. The President or General Manager will implement any cultural transformation programs required for this policy will become, rather than just an internal regulation, a part of the institutional culture and philosophy Auditing Manager This auditing manager will be responsible for carrying out the evaluations about the compliance with the policy and its correct implementation, for identifying any issues that could be preventing compliance, and for proposing any measures or updates that it considers appropriate to the company s Audit Committee that might lead to a stronger policy Employees They will be responsible for uncompromising application of the anti-corruption and anti-bribery policy. They will also act according to the guiding principles of the policy described above, and ensure that each governance body acts according to its responsibilities. 6. Effective date This policy will be effective as of the date it is publishes. 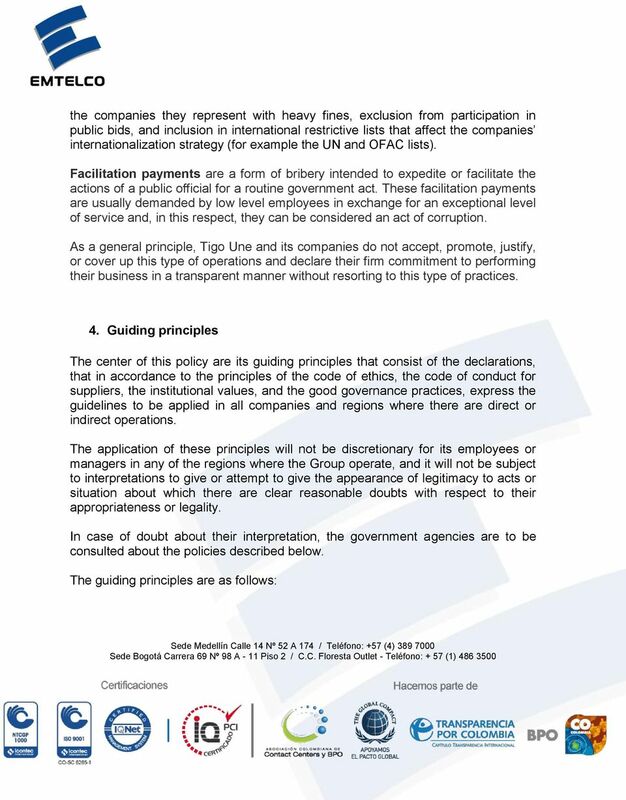 Its principles and guidelines must be applied as they have been established, and all employees and related third parties are obliged to comply with them, and any deliberate or intentional failure to comply will be considered as a serious fault. 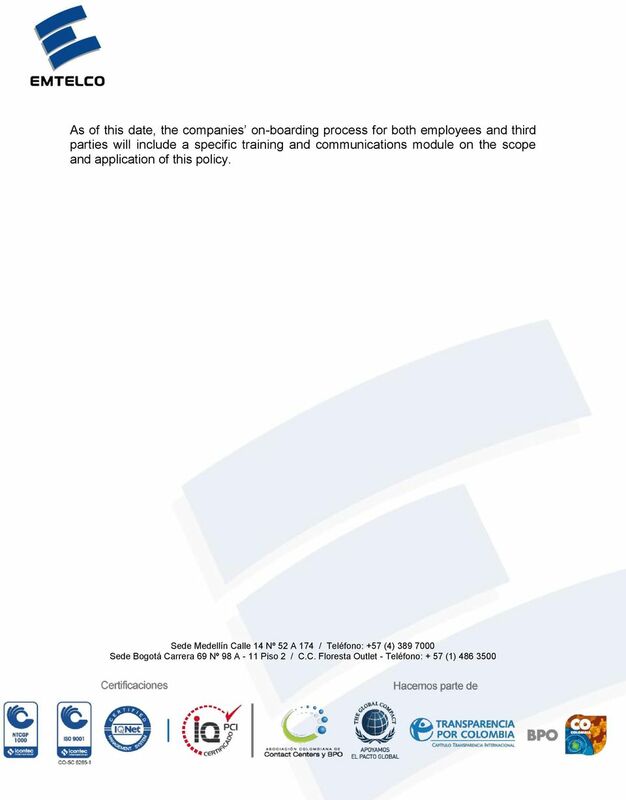 10 As of this date, the companies on-boarding process for both employees and third parties will include a specific training and communications module on the scope and application of this policy. The purpose of this policy is to encourage all related parties to report wrongdoings without the risk of subsequent negative consequences. 2 We guarantee that concerns raised in line with the procedure detailed below will be handled sensitively and in confidence.